As told by Nancy W. Gavin. 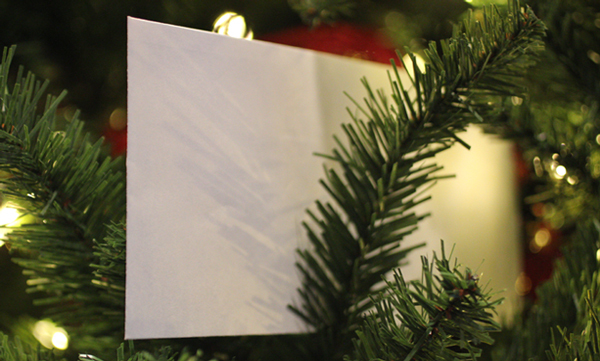 It’s just a small, white envelope stuck among the branches of our Christmas tree. No name, no identification, no inscription. It has peeked through the branches of our tree for the past ten years or so. It all began because my husband Mike hated Christmas–oh, not the true meaning of Christmas, but the commercial aspects of it–overspending… the frantic running around at the last minute to get a tie for Uncle Harry and the dusting powder for Grandma—the gifts given in desperation because you couldn’t think of anything else. Knowing he felt this way, I decided one year to bypass the usual shirts, sweaters, ties and so forth. I reached for something special just for Mike. The inspiration came in an unusual way. Our son Kevin, who was 12 that year, was wrestling at the junior level at the school he attended; and shortly before Christmas, there was a non-league match against a team sponsored by an inner-city church. These youngsters, dressed in sneakers so ragged that shoestrings seemed to be the only thing holding them together, presented a sharp contrast to our boys in their spiffy blue and gold uniforms and sparkling new wrestling shoes. As the match began, I was alarmed to see that the other team was wrestling without headgear, a kind of light helmet designed to protect a wrestler’s ears. It was a luxury the ragtag team obviously could not afford. Mike loved kids – all kids – and he knew them, having coached little league football, baseball and lacrosse. That’s when the idea for his present came. That afternoon, I went to a local sporting goods store and bought an assortment of wrestling headgear and shoes and sent them anonymously to the inner-city church. On Christmas Eve, I placed the envelope on the tree, the note inside telling Mike what I had done and that this was his gift from me. His smile was the brightest thing about Christmas that year and in succeeding years. For each Christmas, I followed the tradition–one year sending a group of mentally handicapped youngsters to a hockey game, another year a check to a pair of elderly brothers whose home had burned to the ground the week before Christmas, and on and on. The envelope became the highlight of our Christmas. It was always the last thing opened on Christmas morning and our children, ignoring their new toys, would stand with wide-eyed anticipation as their dad lifted the envelope from the tree to reveal its contents. As the children grew, the toys gave way to more practical presents, but the envelope never lost its allure. The story doesn’t end there. You see, we lost Mike last year due to dreaded cancer. When Christmas rolled around, I was still so wrapped in grief that I barely got the tree up. But Christmas Eve found me placing an envelope on the tree, and in the morning, it was joined by three more. Each of our children, unbeknownst to the others, had placed an envelope on the tree for their dad. The tradition has grown and someday will expand even further with our grandchildren standing to take down the envelope. Mike’s spirit, like the Christmas spirit will always be with us. This story was originally published in the December 14, 1982 issue of Woman’s Day magazine by Nancy W. Gavin. It was the first place winner out of thousands of entries in the magazine’s “My Most Moving Holiday Tradition” contest in which readers were asked to share their favorite holiday tradition and the story behind it. The story inspired a family from Atlanta, Georgia to start The White Envelope Project and Giving101, a nonprofit organization dedicated to educating youth about the importance of giving. Thanks so much for posting this! What a motivational read to start the week. I love this post and printed it out the first time it ran. When so many are grieving over the loss of a loved one it is a beautiful reminder of the legacy we leave behind. I began the tradition of placing the story in a white envelope and put it in my Christmas tree. It is a reminder to me of the true spirit of Christmas. What a beautiful testimony of how people move on while grieving during the holidays. I hope you run this heartwarming story every year for all to read. Happy Holidays! this story touched me in so many ways, you have no idea. See, I was brought up in Europe, where the materialism of Christmas was not present in our family When I moved to the States with my husband and first daughter, that was one of the first things that shocked me and made me amazingly sad. The spirit of Christmas died, right there. Unfortunately as the years passed, I too became the same as others, and sub-came to the craziness of Christmasing presents. When I was diagnosed with Cancer, 3.5 years ago is when a lightbulb came into me, and I realized how I had changed, how I allowed a lifestyle I was so against had taken over me. Since, I started simplifying my life, and instead, doing more for others, and trying to get away from the commercial Christmas. This year, my younger daughter and I (my older one is about to join our efforts tomorrow), are creating all the decorations by hand and creating memories instead of being at stores. I couldn’t NOT share this! Absolutely beautiful and inspiring! Beautiful and inspiring. Thank you for sharing. Thank you for sharing this story again. I love it every time! I am crying now. i want to do the same for my neighborhood and people in need. Just beautiful. I plan on starting this tradition in honor of my father lost 4 years ago to brain cancer – I really miss my father. Thanks so much for sharing this. People complain about the internet and people addicted to their phones. One thing I love about the internet is that it enables people to share ‘alternative’ views about Christmas and how we should live. There is so much consumerist advertising at this time of year encouraging us all to buy, buy, buy – or be seen as a ‘Scrooge’. But if enough people tell different, alternative stories about what Christmas is about, then people can choose how they want to celebrate. Thanks – this was a lovely story. Wow. I’d never read that story before. By the end, I felt tears welling up in my eyes (and I don’t cry). Thank you for sharing this story and the White Envelope Project! This has inspired me to give to those that have a need rather than giving to those that don’t because of a feeling of obligation. What a beautiful story. I realize it was written long ago…I pray the family tradition lives on throughout generations. May our hearts be inspired to likewise give generously a “cup of water” in Jesus name. What a wonderful story and family. It far outweighs all the consumerism which I stopped being a part of years ago and I don’t miss it one bit. In fact I spend the month of December being happy instead of running around like crazy shopping and overspending. Thank you for sharing this poignant and timely story! It brought tears to my eyes. Peace. I loved this! Thank you for sharing! Wonderful story and reminder about what’s important during Christmas. Gorgeous and moving. Definitely crying. Thanks for introducing this to me. This made me tear up on the bus. I was at work while reading this and it brought a happy tears to my eyes, knowing what Mike had taught his family. And you are a great woman with great sensitivity, empathy and understanding level. So proud of you. Mike will always be close to you. Thanks for sharing. A lovely holiday ritual. My husband died this year of the “dreaded cancer” too, and I have yet to put up our tree. I am going to take this idea and place an envelope for him in the tree, describing a donation to my husband’s favorite charity, Korean heritage camp, which our family attends every summer, to celebrate our adopted children’s heritage ! Thank you for sharing this ! wow. this is so beautiful. I am sitting here in tears and at the same time I am so grateful to have read this story. Thank you for sharing it with us. We can all learn from this. I am sorry for your loss. That story was touching. You truly are an example of how people should approach the holidays. By giving to those in need, we receive so much more back in spirit. This sounds like the best kind of christmas gifts ever. On behalf of all strangers: thank you for your thoughts and generosity. This read brought me to tears. The joy Mike received from giving jumped off the page. I’m sorry for your loss. I’m trying to teach my son the joys of giving this holiday season. He’s agreed to forgo one of his presents and give it away to an underprivileged child. I hope it becomes a tradition. That child will certainly appreciate the gifts more than my son will. This is RAD!!! Exactly what the spirit of Christmas is all about!!! Mike lives on forever!!! What a fantastic story. Embracing the true meaning of giving. You have inspired me to do something similar. This is such a beautiful story. Thank you. Timeless and touching. A tradition that reflects the true meaning of Christmas and one we could all begin. Thank you for sharing. White envelope stuck among the branches of our Christmas tree. Wow this very nice Christmas gift. Thank you for the sharing, best Christmas gift I get this year. Thank you for sharing this with us. It’s good to hear that there are still people out there in the world that know the true meaning of Christmas. Huge, perfectly decorated trees and expensive presents bought isn’t what matters. It’s helping the downtrodden, spending time with friends and family, and most importantly celebrating the birth of Jesus. Brought tears to my eyes.